Meatballs: combine all the ingredients in a bowl and season well. Form into 16 rough balls. The mixture is soft. The meatballs can be made several hours ahead. Cover and chill until ready to use. Heat the oil in a large sauté pan and cook the meatballs until golden on all side and just cooked through. Transfer to a plate. Don’t wash the pan. Beans: add the onion to the pan and cook until tender, adding a little more oil if necessary. Add the garlic, tomatoes, vinegar and water. Season and simmer gently for 5 minutes. Add the beans then the meatballs and simmer for a further 10 minutes. Stir in the basil. 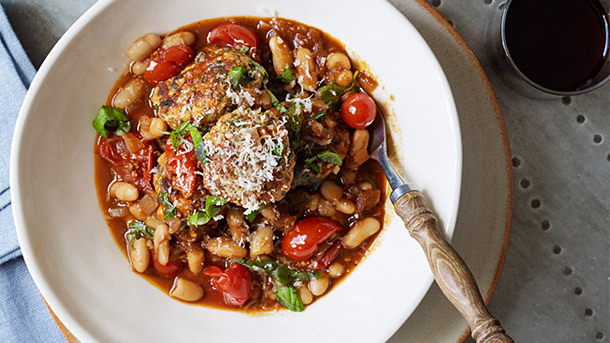 To serve: divide the beans and meatballs between shallow bowls and top with a good grating of Parmesan. End.